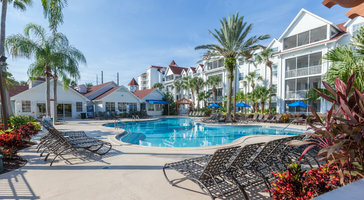 Grand Beach in Orlando is just three minutes from Disney World. The resort is set around scenic Lake Bryan and has its own white sand beach where guests can relax in a number of comfy hammocks. There are several pools for both kids and grownups, a mini golf course, and volleyball court. 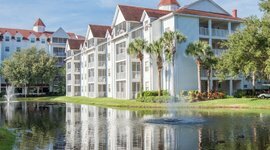 Condo rentals at Grand Beach feature spacious living rooms and full kitchens and are available in one-, two-, and three-bedroom suites. 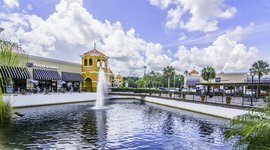 Set along Lake Bryan, Grand Beach is just three miles from Disney World. There are plenty of kids pools, a mini golf course, volleyball, and gorgeous nature trails.